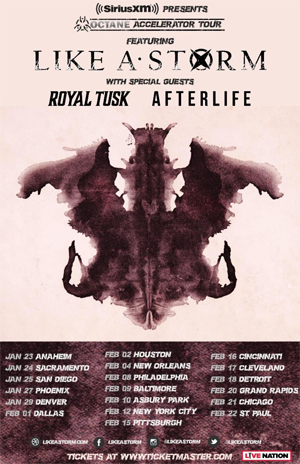 New Zealand hard rockers LIKE A STORM have just announced their 2019 Sirius XM Octane Accelerator Headline Tour with support from ROYAL TUSK and AFTERLIFE. The tour will trek across the US, hitting major markets such as Hollywood, New York, Chicago, Dallas, and more. Fan club and Citi card member pre-sales start today and end on Thursday, December 13th at 10PM local time. General admission tickets go on sale starting at 10AM local time on Friday, December 14th. Fans can buy tickets on LIKE A STORM's website. Before LIKE A STORM heads out on the Sirius XM tour in January, the band will close out the year with a December U.S. headline tour with direct support from PALISADES starting today in Lincoln, NE and wrapping on December 22nd in Las Vegas, NV. This will conclude a year of non-stop touring in support of their most recent full-length album, Catacombs, which was released this past summer via Century Media/RED MUSIC. The band's third LP debuted on the Top 5 Billboard Heatseekers Charts, Top 50 Billboard Emerging Artist Charts, and Top 100 Billboard Album Charts, and was produced by LIKE A STORM's very own Chris Brooks, Matt Brooks, and Kent Brooks. Catacombs is available for purchase and on all streaming devices. LIKE A STORM recently released their new music video for their track "Pure Evil". The video was shot south of Chicago by Vince Lundi at the abandoned Methodist Church of Gary, IN, notorious for being one of the most dangerous cities in America. Watch the video for "Pure Evil" on KNAC.COM HERE. LIKE A STORM has toured the globe with some of the biggest names in rock - including GODSMACK, ALTER BRIDGE, SLASH, OZZY OSBOURNE, SHINEDOWN, THREE DAYS GRACE, on top of headlining North America extensively. They have also been invited to perform at the world's biggest hard rock festivals including: Download (UK), Nova Rock (Europe) and Rock on the Range (U.S.). Their reputation for touring the world relentlessly led Myles Kennedy of ALTER BRIDGE/SLASH to once label them, "The hardest-working band in the business." LIKE A STORM recently wrapped a massive U.S. run supporting GODSMACK & SHINEDOWN, where their high-energy live show garnered thousands of new fans.